Designed with a one piece curved lens for an undistorted, clear 180-degree field of vision and finished with anti-fog technology and a easy adjustment push button for the perfect fit. Designed for comfort and ease of use, with soft silicone gaskets and a 1 piece curved lens. The Turbo has been designed to sit comfortably against your face during swim sessions and is easy to adjust with a push button either side. 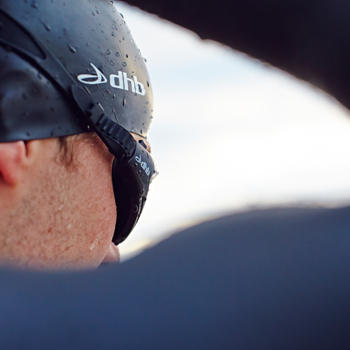 The one piece curved lens design ensures exceptional 180-degree visibility and feature anti-fog technology so that you can focus on your swim. Tinted lenses are great to used in sunny or cloudy conditions and work as a great bit of kit to have in your swim bag. Tinted benefit you the most however when being used in direct sunshine or high level lighting; Tinted lenses reduce glare and the reflection of the sun or light. dhb Turbo Tinted Lens Goggle is rated 4.3 out of 5 by 62. Rated 4 out of 5 by Josh91 from A good set of affordable outdoor goggles. I’ve had a set for several years before part of the strap snapped. Would get again. Rated 5 out of 5 by aldrin from great price for great goggles Good fit with a slightly larger lens than some others I've had before. They keep my eyeballs dry, sort of. Rated 1 out of 5 by Han37 from Product is poorly made I bought a multi-pack (of only 2) of these googles. One pair broke within a month of receipt - issues with the seals. Rated 1 out of 5 by NickJames from Poor seal / poor design The seals on the goggles seem amazing at first, but because they are so large the goggles project off your face. Whenever you tumble turn, look sideways or anything other than swim in a straight line the goggles get ripped off your face. On top of this, because this happen so often the seal actually came free from the goggles eventually rather than my face, rendering the goggles, after 3 months, broken : ( Not what I've come to expect of DHB products. Are those googles UV protected? The lens will come with a UV coating.